We were standing in the parking lot of the Poop Deck Restaurant and the Nassau Yacht Haven talking to the folks from the sailboats Troubadour and Endaxi when a taxi pulled up with Brad. He had done the ‘red-eye’ from Vancouver, through Toronto to Nassau. A sight for sore eyes! We were anchored near Paradise Island just off the Cloisters – a 14thCentury French monastery, imported to the US by Randolph Hearst and then to the Bahamas by Sir Huntington Hartford. We had suffered through wind and wake in our previous spot and worried about dragging our anchor (attached to the air conditioner on the bottom) and then over coffee at about 10AM our scenery started to change as the Blue Pearl started to drift. We had to fuel up for our trip with Brad so we pulled in the anchor, left the hardware on the bottom and headed to the fuel dock. Our new setting off the Cloisters was beautiful and our anchor was buried in sand. We had groceries and, most importantly, conch salad from Potter’s Cay so we headed out to the Blue Pearl with our new crewmember. We spent a great evening catching up with Brad, installing the hardware he brought to make our alternator work and enjoying boat drinks and cracked conch a la Pam. 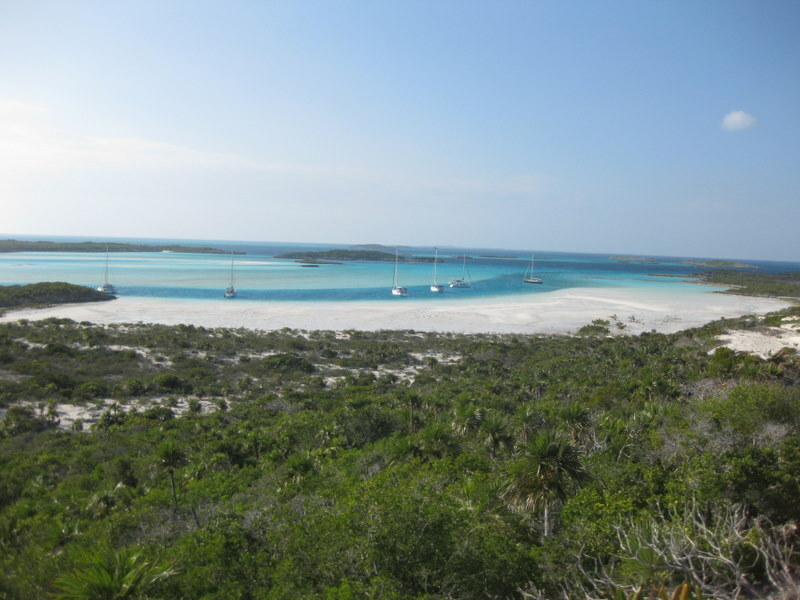 The next day we sailed and then motor sailed to Norman’s Cay, arriving at about 3 pm. We anchored near the partly submerged plane and then took a dinghy ride to show Brad around, took the obligatory photo in front of the “Welcome to Norman Island” sign and then retired to the boat for wasabi encrusted tuna with rice. The next morning, one of our acquaintances from Indiantown came by in his dinghy on a hunt for fish and lobster. Nice to meet up with Ian and Elaine from “Stormy Weather” again! 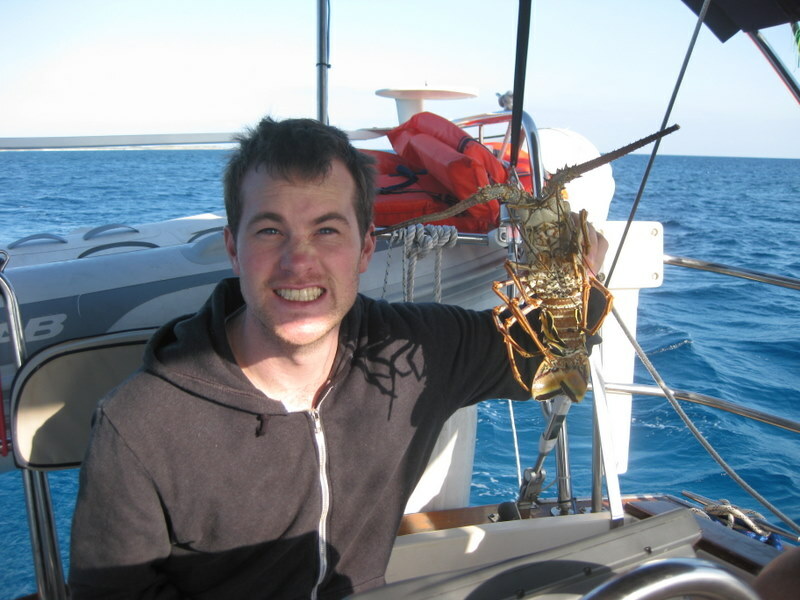 We set out to find our own lobster and fish. Intrepid hunters Brad and Glen searched faithfully for a couple of hours without any success while Pam followed in the dinghy. In the meantime, Ian had pulled 4 ‘bugs’ from the caves and crevices. We followed them into Norman’s Pond, where they had anchored. Ian showed us where the nurse sharks hang out (none home, thankfully!) and where the eagle rays swim – so Brad went swimming with the eagle rays and a barracuda. 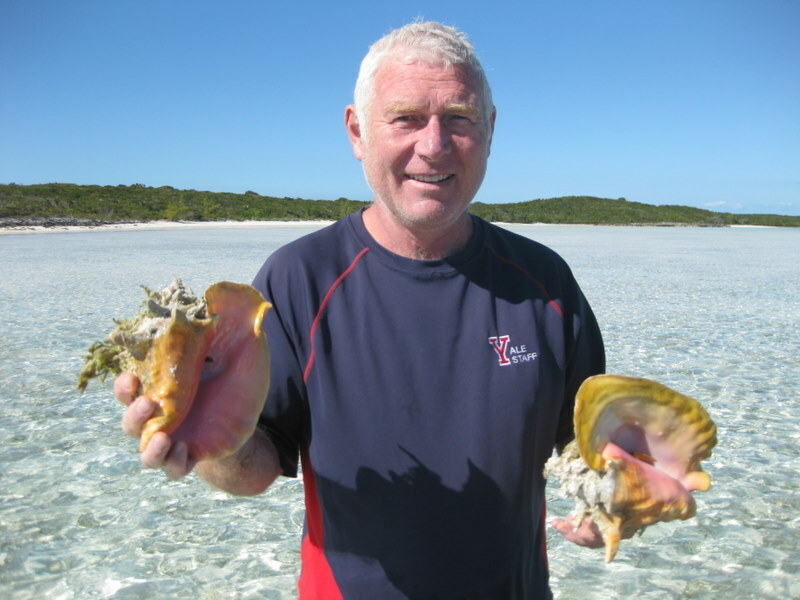 Finally, we were successful in our hunting and gathering – we found 14 mature conch and we headed back home to extract them from their shells. We visited at Stormy Weather as we left the Pond. Ian must have felt sorry for us because gave us 3 lobsters! We headed over to Mac Duff’s for awesome burgers and by 6:30 we were back on the boat… exhausted. Glen and Brad’s heads were nodding like bobble heads and not providing Pam much company. By 8:30 it was all over – everyone sound asleep. On Thursday we woke to a rocky anchorage – the wind had shifted to the northwest and the rollers made it uncomfortable. We took the outside route to Warderick Wells, averaging 6.5 knots in a great breeze. 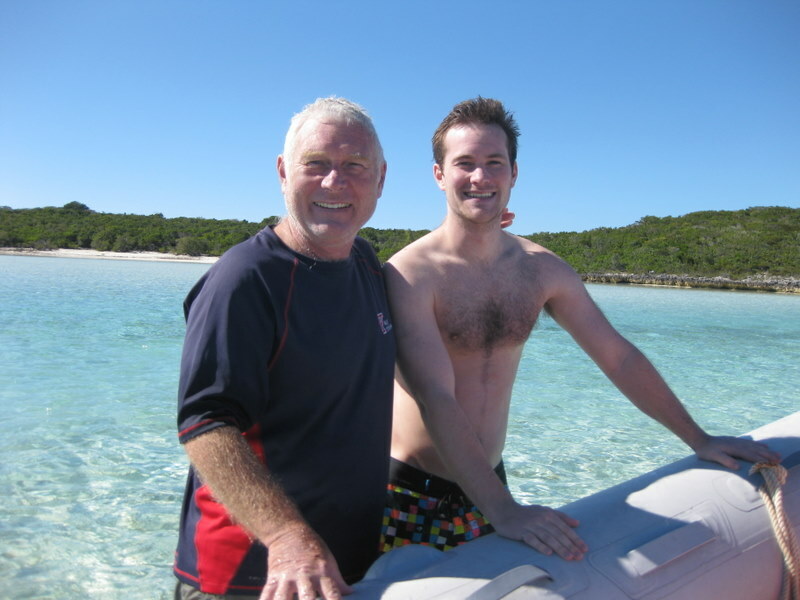 Brad made a daring rescue of the mooring ball as we charged into the harbour with crazy wind and currents. 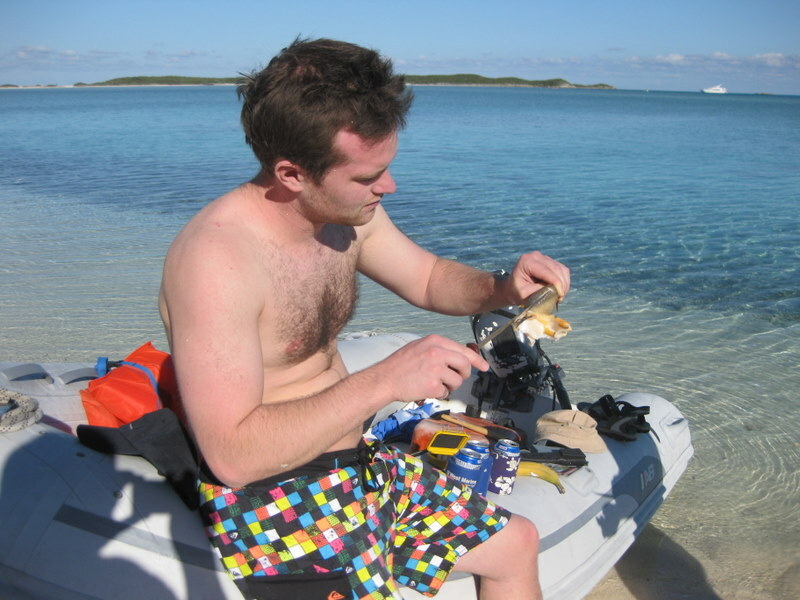 Conch salad, a Kalik and we were set to go to register with Darcy in the Exuma Cays Land and Sea Park office. We are spending Christmas Eve here eating and drinking – like everyone else does on Christmas Eve. We will travel on Christmas day to Staniel’s Cay to show Brad new territory. We are hoping there is a Junkanoo and other holiday activities. Weißwurst dinner. On my lap lies Amelia, the new kitty. We're calling her Conehead, as she was just spayed two days ago and has the plastic cone on her head. We like to think of it as a satellite dish and, when she's on her pain meds, she's tuning to her mother planet. :D It's pretty funny. Unlike Capt'n Pants, our giant male cat, Amelia is a lap cat. It's lovely. So from the Funk Farm menagerie to the Roger Brigade: Merry Christmas! All these names being mentioned and pictures taken just brings back such wonderful memories of a truly enchanting place and we can hardly wait for our return. How nice is it that a Pa and Ma can share this with "the boy". Christmas will be very special this year we are sure. 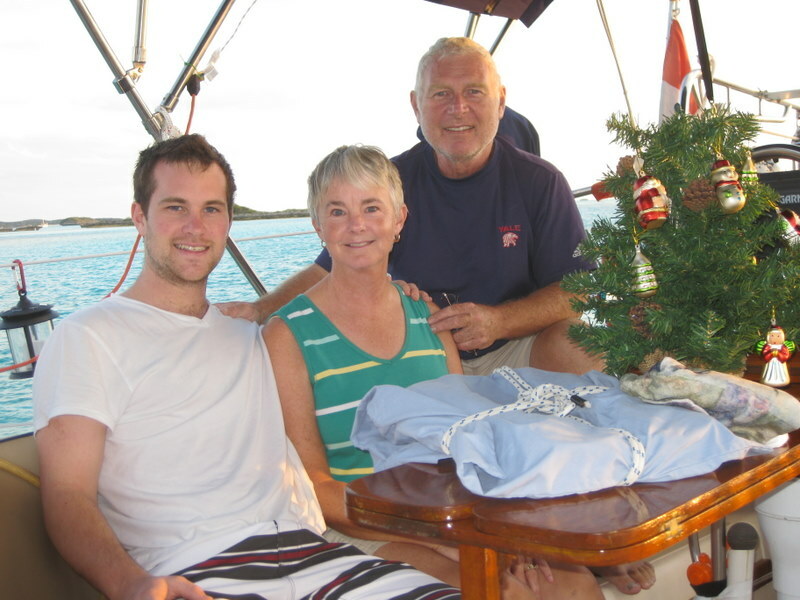 Tip a glass of wine for us and a Very Merry Christmas to you Pam, Glen and Bradley in the Paradise of the Exumas. The conch and lobster may just beat the turkey and fixings. The merriest of Christmases to the Rogers family from the Halls. You're sure enjoying better weather than we are, but it's the people you're with at this time of year that is most important. (okay, we're still jealous) Happy sailing throughout 2011! !